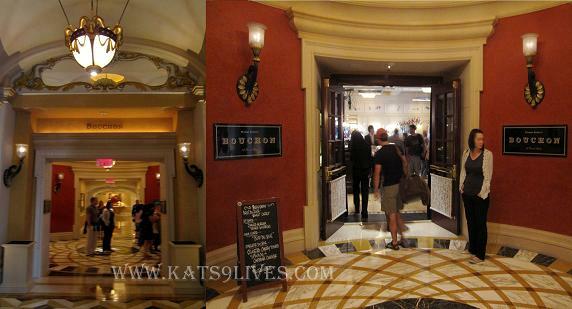 Kat's 9 Lives: Bouchon : Doing Vegas Right! Us crazy girls decided last minute that we would take a quick trip to Vegas. We left at 4 AM in the morning and started heading out. I was planning to sleep in the car but we just ended up singing and chatting for the longest time. This really did not help my health as I was really sick but c'est la vie! There was no traffic in the middle of the night and got there early in the morning. I suggested that we go to Bouchon in the Venetian for breakfast. 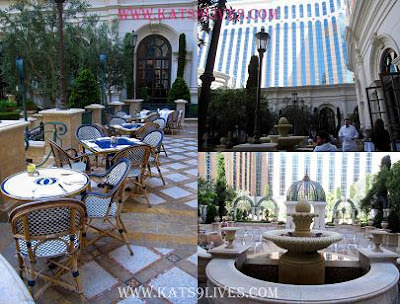 Last time I was staying at the Venetian, I attempted to go but the room had the wrong information on their hours. Bouchon does not offer reservation for breakfast. It is a first come first serve basis. There was a 10-15 minute wait and a waiting area where we sat down and took more funny pictures. Of course I spent the whole time photographing the dining room with a few funky exceptions. O=9 Their interior decor was very old school. 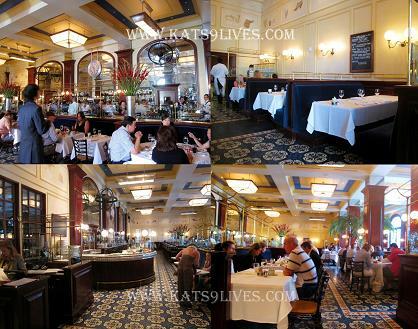 It gave me the nostalgic classy Parisian vibe that suited the ambiance. At first we opted to sit outside but it was quite nippy. Don't worry, before we went in I made sure to take enough pictures first. Even the staff sort of mocked us for being weak and moving back in. =( lol I was very sick and didn't want to risk getting worse so it seemed like the best move. The garden pool is across the courtyard. If it isn't cold outside, then I would recommend sitting there enjoying the ambiance and view. 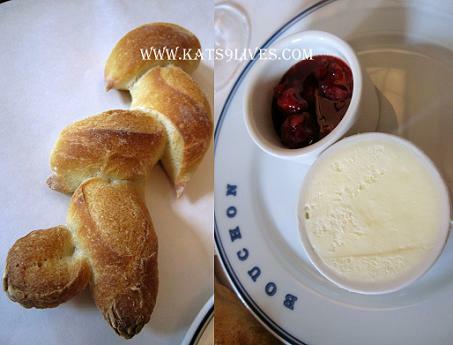 Chef Keller's restaurants have a very unique way of serving bread. Many of them serve the fresh bread by plopping it onto your table. They also brought us Strawberry Preserves and Butter. I have to say the bread was delicious. It's simple goodness. Maybe I was starving from staying up all night, but I really loved the combination of strawberry and butter. This definitely started the morning out right. I know it might sound weird to say that it was light and refreshing when butter is involved but this will keep me smiling for a while. So here is where things started going South... the first lady was super sweet and nice but our server... well that is a whole other story. There were barely any females working there except the hostess. The men were not very friendly or competent at times. While we were waiting for our food, suddenly a staff dropped this plate onto our table and left abruptly without saying anything. We all looked at each other and questioned what this was. TP and Veggie Girl each ordered a Baguette with Nutella and Scrambled Eggs. What was plopped on our table looked like a croissant. I was trying to make up some false reasoning that this is a "modern" baguette... lol They thought that they messed up their orders and I actually fought for them because I wouldn't think they did. I was wrong... we asked the server and he completely messed up that simple order. The funny thing was when he took our order he whipped out this leather bound notepad and wrote down the order in a serious manner. Quite hilarious. My order was not messed up so I wasn't as perturbed of the whole mess. I decided to bite the bullet and try the Chicken and Waffles, which was $26. It's an interesting high end take on a classic dish. Here it comes with Roasted Chicken accompanied with a Bacon and Chive Waffle. The sauces were Tahitian Vanilla Bean Butter and sauce Chasseur. What really caught my eye was the bacon and chive waffle. How can you ever say no to bacon? Perish the thought! The roasted chicken was flavorful and cooked to perfection. I enjoyed the savory flavor by itself and even combining will all the components. The waffle was solid and fluffy. TP and Veggie Girl thought the combination of chicken and waffles was crazy, but I like mixing savory and sweet. Each of the components could stand alone in taste and flavor. When combining them, something goes amiss. Still, I enjoyed everything. The sauce Chasseur didn't really work for me, but I liked the sweet syrup to add to the savory flavors. I would definitely recommend this dish and order it again. Not sure if it is quite worth the price, but then again this is Bouchon and Vegas. When in Rome. That bread with the strawberries looks amazing. I hope you're having fun in Vegas! I don't think the one in LA does breakfast yet. I went that one time assuming it did and was so wrong and ended up eating a terrible lunch. 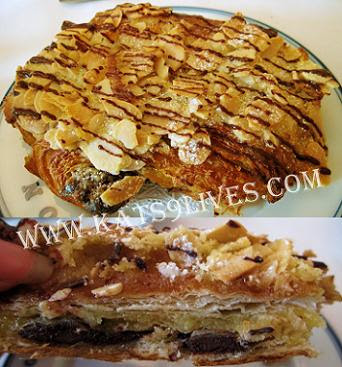 That chocolate almond croissant looks like quite a find! My new favorite Vegas restaurant is Table 10 at Palazzo. @Trekkie - I think you told me last time. I am so sorry to hear that for you because I went for dinner and I know how you feel. The breakfast sounds much better than lunch or dinner. =*( We were both tricked! @Cookie Sleuth - Yah, the croissant was surprisingly good. The pastries there were pretty good overall. I have had the Macaron they sell in the Venetian and they were pretty good too. I will have to try Table 10 the next time.